Miyabi Evolution Knives are very unique in both steel composition and blade design. These Western-Style blades feature a clad core of Miyabi's proprietary FC61 steel honed to a scalpel-like edge. This series is ideal for the cook that prefers the feel of a European knife and the edge-retention of a Japanese steel. Miyabi Kaizen Knives (Japanese for "improvement" or "change for the better") feature 32 layers clad on each side of an VG-10 "super steel" core, creating a beautiful Damascus flower pattern. Each blade is hand-honed using a traditional three-step honbazuke process, which are then Cryodur ice-hardened for enhanced hardness and flexibility. The handles are black micarta, which are accented with a mosaic pin, red spacers, and metal end cap. Miyabi Fusion Knives were designed by Iron Chef Masaharu Morimoto. Each knife features 32 layers clad on each side of a VG-10 "super steel" core, creating a beautiful Damascus flower pattern. Each blade is hand-honed using a traditional three-step honbazuke process, which are then Cryodur ice-hardened for enhanced hardness and flexibility. The triple-riveted western style handle is of black resin with a full tang and eye-catching red accents. Miyabi Birchwood Knives feature 50 layers clad on each side of an SG2 powdered steel core, creating a beautiful Damascus pattern. Each blade is hand-honed using a traditional three-step honbazuke process. The blades on each Miyabi Birchwood knife are Cryodur ice-hardened for enhanced hardness, flexibility and are corrosion resistant. Its sharpened twice on whetstones with custom grits, followed by mirror polishing on a leather wheel. Miyabi Black Knives are an example of a highly reputed production knife maker pulling out all the stops to showcase their best work. Micro-Carbide steel with additional elements to the alloy has undergone multiple heat treats including sub-zero quenching to obtain a 66 Rockwell hardness. Aesthetic features include 132 layers of Damascus cladding with flower design. Steel end cap with logo, Big Leaf Maple burl wood handle with mosaic pin. Hand sharpened with Honbazuke honing prior to packaging. Miyabi Artisan Knives feature an innovative SG2 Microcarbide steel core that has been clad with layers of nickel and stainless steels to create a "Tsuchime" pattern hammered finish. Hand-formed and honed in Seki, Japan, the artisan series is an amalgam of modern scientific achievement and classic quality craftsmanship. The beautifully clad Artisan blades are well paired with hefty Pakka Rosewood handles that have been carefully contoured for an exceptionally comfortable grip. 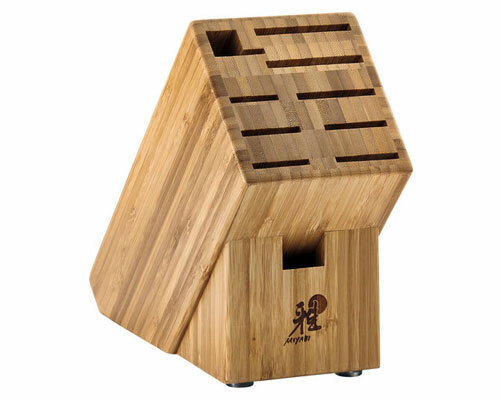 The Miyabi 12 Slot Bamboo Knife Block was designed to hold 9 knives, kitchen shears and a honing steel. Made using durable bamboo, and each block has rubber feet that prevents the block from slipping and sliding. 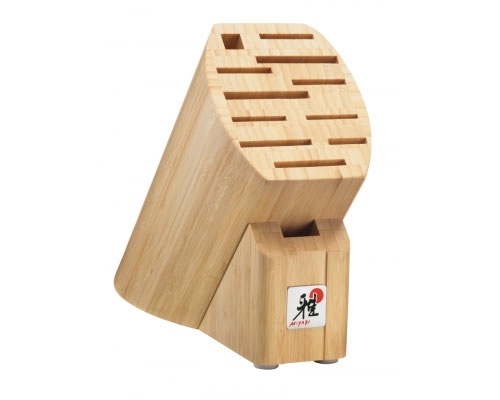 The Miyabi 10 Slot Bamboo Knife Block is designed to hold 8 knives, kitchen shears and a honing steel. Made using durable bamboo, and each block has rubber feet that prevents the block from slipping and sliding.